Finally putting the clues together Superman realizes the Hyperclan are Martians, which we later learn are Pale Martians, a warlike race of Martians responsible for Earthlings never gaining full superpowers outside of the occasional metahuman. He breaks free and J’onn reveals he took the place of one of the other Hyperclan members. He frees the others from the Flower Of Wrath and aided by the citizens (after Superman goes live to tell them the Martians fear fire) defeats the Hyperclan’s invasion. As punishment J’onn has them brainwashed to become normal Earthlings. To create a barrier against future invasion attempts the Justice League build a new headquarters on the moon, the Watchtower. What they got right: A lot of good fight scenes. Superman shows his skills as an investigative reporter to put the clues together, and later it’s his being Superman that allows him to break through Earth’s fear of the invasion and fight back. We also get a good threat that will return in the DC Universe. I’m not sure if they’ve shown up in the New 52/DC You/Rebirth timeline but maybe they should if it can be done right. What they got wrong: I’m all in favor of showing that Aquaman is cooler than some people think, but now he can manipulate people’s brains due to their “aquatic ancestors”? I don’t think that’s how his telepathy works, and having Aquaman causing even temporary brain damage is not something I’m comfortable with. Also, is that just a photograph of Earth when they’re looking out the Watchtower window? I’m not a good artist and even I wouldn’t be that lazy. Recommendation: This first story arc was quite good. 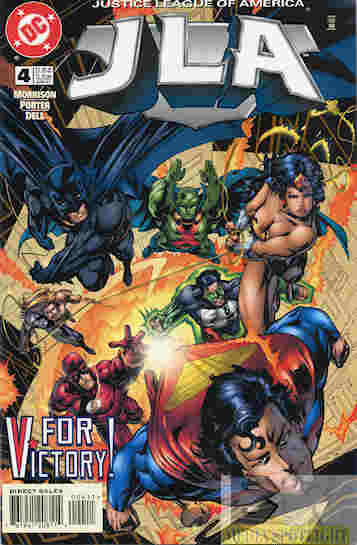 It’s the debut of the Watchtower (although the specifics have changed from one continuity to the other–for example in the aforementioned Justice League Action it’s on Earth but on a volcano while it was a space station orbiting Earth on Justice League/Justice League Unlimited) and the pale Martians. It’s worth picking up. Posted by ShadowWing Tronix on May 14, 2018 in DC Spotlight, Yesterday's Comics and tagged DC Comics, DC Universe, Hyperclan, Justice League, Martian Manhunter, Superman.